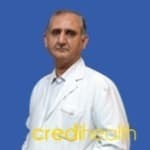 Dr. Sumir Dubey is one of the best Cardiologists in Rajender Nagar, Delhi. Doctor has had many happy patients in his/her 38 years of journey as a Cardiologist. Doctor is a MBBS . Doctor is currently practising at Sir Ganga Ram Hospital-Delhi in Rajender Nagar, Delhi. Book an appointment online with Dr. Sumir Dubey and consult privately on Lybrate.com. Lybrate.com has an excellent community of Cardiologists in India. You will find Cardiologists with more than 40 years of experience on Lybrate.com. You can find Cardiologists online in Delhi and from across India. View the profile of medical specialists and their reviews from other patients to make an informed decision. She is 50 years old working women. Everyday in evening, after coming home, she feels so weak & tired that she cannot do simple hometasks only. Shortly, sometimes she also has low BP. Pls suggest. Hi lybrate-user, according to her height she is normal in the category. No need to worry for her weight. Tell her to take small & frequent meal, try to include all the food groups in diet. Advice her to take more & more fruits and vegetables. Whenever she feels weakness, regular monitor her b. P. If needed give her lemon water with sugar & salt. My bp is average between 130-140/100 to 110. Feel heaviness on heart, pulse is between 85-93. Ecg, tmt, echo are normal. Should I take medication for above mentioned bp. I was advised restyl for 5 days only. Last few weeks I'm not able to sleep normally. I feed heaviness in my chest and also breathing need extra push. I can't sleep in the night and I need to sit on sofa for normal breathing. In the morning at 6 AM this problem gets solved. Dr. Whenever she is doing a normal work like cooking, talking to someone on phone, going upstairs etc. She feels her pulse rate very nearly 105-115. Which is abnormal. I have checked her bp and pft and chest x-ray and she is taking medicines prescribed by a chest care Dr. But the condition is not good. So please suggest me the proper solution regarding to this problem. If her Hemoglobin is low, she may feel these symptoms. Check it once again and if level is less than 11 gms % then she needs anti anaemic treatment. Also check her T3 T4 and TSH levels if not done yet. Thyroid may also make her feel like this particularly hyperthyroid state. You may consult further after the reports. Hello doctors my name is wajid and I wanna know that if someone has problem of blood pressure then what is the best thing that he/she can do for his good health and also how to get rid of this disease or problem? Hello lybrate-user inorder to control high blood pressure salt free diet should be adopted. Regular exercise with good amount of sleep is needed. Practice pranayam and suryanamaskar which strengthnes heart muscles. Sir mera bp kaam khasi ho my bp is coming160/100 .i m a quite and serious type of person sometimes I become short tempered. My age is 35 male, I am a non smoker I had smoking habit but left it before 5 years. Due to frequent chest pain, I consulted a cardio doc and took, echo test, thread mill test, x ray and also all blood tests all are normal But my echo showed grade 1 MVP which I took one year back The thread mill test I took two months back it's also fine Should I go for echo early once to see its condition I don't have bp or sugar also Pls suggest is grade 1 MVP serious. Get a 2d echo done every year and if necessary and symptomatic I will suggest you to get it operated as early as possible. I hve heart problem my 3 valve is now damage so which medicine should I take for myself best. There is no medicine for valve damage. Surgery is the only solution. Get checked and treated by a surgeon. Hello Sir, I have been diagnosed with cholesterol 245 and LDL is 162 in my Lybrate reports, so what is the impact of this on my health or in future any diseases can happen? Please suggest me. Cholesterol is bad for your health.in future if not control you can suffer from heart attack and hypertension. So control cholesterol. Which is the Ayurvedic medicine, helpful in regulating the heart beat i.e. To keep the same at normal level and maintains required rate of ejection fraction of heart. Terminalia Arjuna bark is a basic plant but as per given conditions other herbs are added to regulate excretion of liquid (urine), Mucous excretion (ama nissarak) etc. To facilitate normal and accurate functioning of heart. Its not overnight care. You have to stick to for few months minimum to enjoy new lease of life. No current medicines to be stopped without your doctors advise. Let him sday himself to reduce the dosage if not stop. Pl consult online for best experienced regulation techniques by herbs.